The TIE bombe is a larger, less maneuverable version of the TIE Fighter used for destroying larger Rebel ships and pinpoint planetary bombardment. 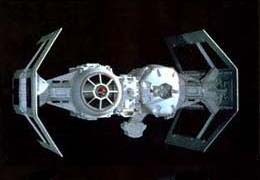 It can carry large numbers of torpedoes, bombs, orbital mines or thermal detonators. The bomber is also slow and not very maneuverable and must be protected by fighters.